The South Korean e-Book market is one of the ten largest in the world. The overall book market is currently worth about $3.2 billion in revenue per year, and that amount is expected to grow 30% over the next few years. e-Book sales have steadily been climbing with $178 million in sales in 2012 and over 228 million in 2013. South Korea’s mobile phone penetration rate topped 100% in 2010, meaning that there are more phones than people in use in the country. The rate was 111% as of 2013, according to data provided by the International Telecommunication Union. This gives the online bookstores tremendous reach and digital books are suddenly finding a more captivated audience than ever before. The Korean e-Book market is basically exploding right now, and keenly aware of this fact is the local brick and motor bookstores. In 1999, there were around 5,000 bookstores in Korea, today, there are barely 1,500 nationwide. The bigger chains such as Kyobo, Aladdin, Youngpoong, Yes24 and Bandi & Luni’s have all successfully transitioned into selling e-Books. YES24 is likely the largest player in the market and controls 42% of all e-Book sales. On average, their nine million registered users purchase around 100,000 titles each day. The company also also launched their own dedicated e-readers, the Crema Touch and Crema Shine. They retail from $120 and $150 respectively. To-date, more than 50,000 units of the e-readers have been sold. Meanwhile, the largest bookstore in Korean, Kyobo started an e-Book subscription service in early 2013. 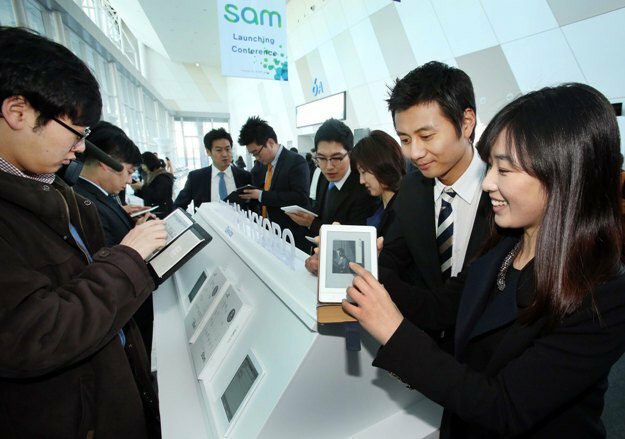 It is called “Sam” and readers can sign up for a one-year membership and borrow five e-books for a monthly fee of 15,000 won ($13.82). Kyobo also offers a bundled package of e-book rentals and its own e-book reader, luring potential bookworms with a discount. “The reason why we offer this book service at such a low price is because Sam aims to increase the reading population in Korea. Instead of possessing books permanently, readers can have downloaded books saved in the device for six months and download more afterwards. The core concept of our service views books as part of consuming,” said Jin Young-gyun of the Kyobo Book Center PR department. One of the barriers that prevents the digital market from truly exploding, is primarily due to pricing regulations. Brick and Motor stores can only give a 15% discount on print or e-Books. This has given rise to the gifting culture, where you are normally given a mug, coupon or gift voucher. This plays nicely into the hands of Ridibooks, who are trying to position themselves into one of the big boys. The startup was founded in 2009 and recently raised 8 million in series B funding. They boast two million users, while more than 32 million e-books have been downloaded using its platform. One of the edges that Ridibooks has is that they don’t offer any print books, so e-Books doesn’t cannibalize their own sales like the brick and motor stores do. Another interesting article. Thanks, Michael. Great article, but “local brick and motor bookstores” it aint. Unless this is some crazy Korean concept where buildings are made out of bricks that are kept in place by motors. thanks for the information, very interesting glimpse! By the way, it is brick and mortar. magnificent info thanks for sharing keep it up.